We've put together the ultimate fashion face off between the Royals Rebels vs. the Ghouls in School. Ever After High vs. Monster High Fashion Face Off - Who Wore It Best? Does your closet need some fairy tale inspiration? Take inspiration from our Disney's Descendants lookbook to recreate looks from Mal, Lonnie, Audrey, and more! Score back to school fashion inspiration from Ever After High favorites like Apple White, Raven Queen, Briar Beauty, and more! Get school picture day fashion inspiration from Disney princesses like Jasmine, Belle, Cinderella, Pocahontas, Ariel, Elsa, and Rapunzel! Back to School: Disney Princess School Picture Day - Lookbook Cinderella, Jasmine, Belle & More! Score back to school fashion inspiration from MLP favorites like Pinkie Pie, Rainbow Dash, Fluttershy and more! Get beach summer style inspiration from MLP! My Little Pony Beach Fashion Lookbook Pinkie Pie, Rainbow Dash, Fluttershy & More! 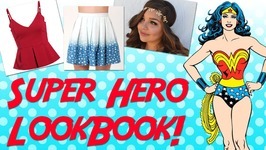 Give your wardrobe super powers with this superhero lookbook! Superhero Style Lookbook Wonder Woman, Bat Girl, Super Girl & More! Barbie's style has transformed over the years from the 1950s Barbie to the modern day Barbie. Watch our lookbook to get inspired - Barbie style! What if you were a princess? How cool would that be! Princess fashion, style, accessories, and transportation has changed over the years. All About Princesses Then vs. Now - Fashion Style Accessories More! Disney princesses, Equestria girls, Ever After High, and PLL's know what's cool when it comes to fashion! We've compiled the best fashion looks trends from your favorites like T.
Ever After High Disney Princesses My Little Pony more! Fashion Lookbook Compilation! Disney princess style is the best style for prom! Prom dresses, prom makeup, prom hair, prom nails, prom jewelry and prom shoes all inspired by Disney princesses, Elsa, .. It's time for Spring Summer style! Check out our take on the trends, plus our fave DIYs for the warm weather! Spring Fashion & Summer Style - DIY & Trends feat. Jrzgirlz! It's time for a My Little Pony inspired prom look book! It's time for more Disney princess inspired style! Check out new takes on Belle, Merida, Pocahontas, and of course Cinderella! Disney Princess Style Cinderella DIY w/ Jrzgirlz! Let's get some fashion inspiration from the ladies of Fifth Harmony! 5H Look Book, aka How to Dress Like a BO! Fifth Harmony - How to Dress Like a "BO" - Look Book! Let's get inspired by Cinderella! Here are 6 style tips from the new Cinderella movie from Disney! Check out our compilation: Best of My Little Pony on the Rundown! We put together all of our favorite Dream Mining MLP themed episodes. Enjoy! MY LITTLE PONY - MLP Games! Mash Ups! Fashion! - Best of MLP on The Rundown! Disney Costumes for Halloween. From the cutest Cruella Deville to the most imaginative Alice in Wonderland! Tell us your favorite and what you're going to be for ..
Fall Fashion is here and so is Shannon from jrzgirlz! Check out our favorite fall fashion items for 2014, and be sure to catch Shannon's DIY tutorial on how to make .. It's time for a My Little Pony: Equestria Girls look book! Get inspired for back to school with Fluttershy, Pinkie Pie, Rainbow Dash, Applejack, and Rarity! Celebrity style inspires this Back to School look book! Get your back to school outfits ready with help from Chloe Moretz, Taylor Swift, Katy Perry, Ariana Grande, and more! Ever wonder what Cinderella would wear on her first day back to school?? Check out our Disney Princess "Back to School" Look Book to find out! We pick modern outfits ..